Chelsea star man Eden Hazard has been handed an injury scare after hurting his back during the Blues 2-2 draw with Manchester United. Eden Hazard has suffered an injury scare after hurting his back in Chelsea’s draw with Manchester United. The 27-year-old’s performance dropped off after the break and Hazard told friends afterwards that he could not accelerate properly. 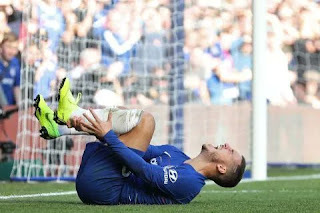 Maurizio Sarri, the head coach, kept Hazard on the pitch for the full 90 minutes, but his movement was restricted when he woke up on Sunday morning. The problem is not rated as serious, but could still rule Hazard out of the Europa League tie against Bate Borisov on Thursday and the trip to Burnley three days later. Losing Hazard for any period would be a blow to Sarri, following the player’s incredible start to the season. Even though he did not get on the scoresheet against United, Hazard has netted eight goals in his past nine appearances. Hazard’s form has been particularly crucial to Chelsea as record signing Alvaro Morata continues to struggle to justify his price tag. Ruud Gullit, the former Chelsea manager, has even claimed Hazard and Willian do not want to pass to the Spaniard, who has scored three goals this season. Speaking on beIN Sports, Gullit said: “His team-mates don’t come into any positions where they create anything for him. The worst part is you can see Willian and Hazard always dribble inside because they don’t trust him.